With careful, albeit sweeping, strokes the space between the lines fills with colour. In this case — one. A vibrant blue had been selected to colour everything from the tip of the bunny's tail, to the carrot in its mouth, to the flowers on the ground. This was my granddaughter's project and she is becoming well known in the family for her monochromatic artwork. Watching children colour is an interesting study. Seeing my favourite four-year-old put crayon to paper during some quality time this past weekend I couldn't help wondering what she saw in what she was creating and why she made the choices she did. Having her select the palette for the flowers I was working on resulted in yellow stems and brown petals, nothing like anything in the spaces she explores outdoors each summer, yet she had confidently suggested them as the perfect choice in this. Also, I decided her approach to colouring rather reflected her personality. Despite her tender age, she takes great pride in doing something well. Which I suspect explains the care, concentration and determination put in to her efforts to stay within the lines. She's a shy, enigmatic sweetheart, who looks at the world around her with an excitement underlined by a degree of caution. I wondered if this trait is reflected in her careful choice of one playful hue. It dawned on me that when it came to a level of risk, she had put it onto my work, rather than her own. To further develop my theory I looked to her little brother, a charming two-year-old scamp in whom we can already see wit and mischief. When he sits down to colour it's with a burst of energy. He's totally committed to the fun, rather than the result. Then too, there is their two-year-old cousin, a lively and flamboyant darling, fond of tutus, tiaras and showing off her impressive dimples. When presented with a colouring book, she will fill it with broad strokes of meticulously chosen multiple shades, throwing herself wholeheartedly into the task. You might think I'm reading too much into such a simple task. Yet, having recently attended my first paint night my thoughts turned inward as I reflected on how I approached the canvass. There was, just as I am, nothing bold, nothing careless. Every detail was thought out to the extreme; my strokes contained and cautious. Given my tendency to be hard on myself, I was disappointed that my work wasn't exactly like the example with which we'd been provided. Only later did I remember that this is art — originality is best. There was no conscious thought at the time about my personality and how it might come through in art. It happened after seeing the results and recognizing that I had painted like I am. It was a natural progression then to notice the same in my grandchildren, apparently. None of this has any real relevance, of course. It's all just the random thoughts of an introspective person. 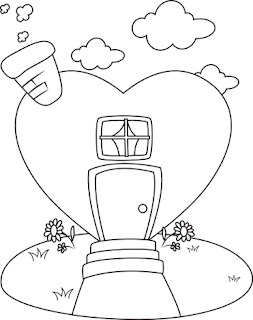 But, knowing how much children love to colour and keeping in mind that Valentine's Day is on its way, I decided it would be a great focus for today's image collection. 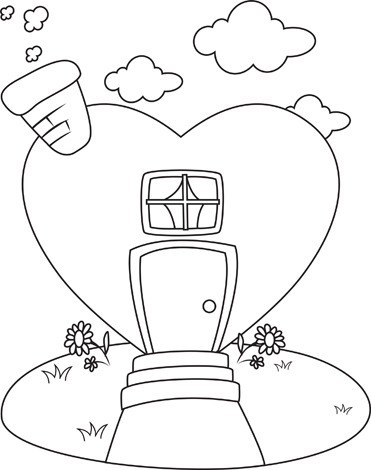 Click the link below to find hours of colouring fun for young and young-at-heart.